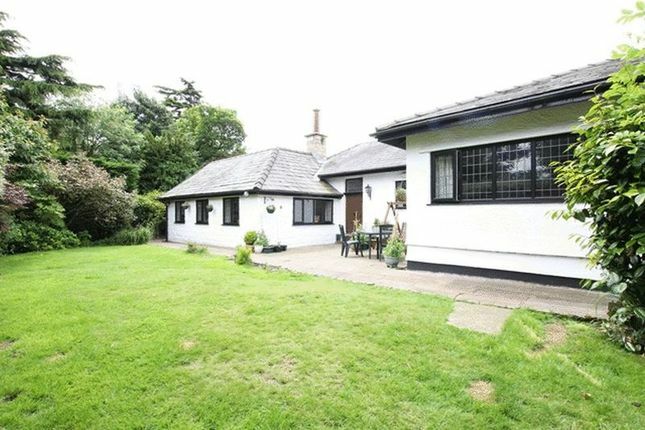 Move Residential are delighted to present for sale this extended, character three/four bedroom detached bungalow. Set back from the road with gated access, a long driveway approaches a detached double garage and the attractive property frontage. 'Thatches' has been recently redecorated throughout and offers spacious and well planned living space briefly comprising an entrance hallway, lounge with beamed ceiling, dining/;sitting room with feature fireplace, large breakfast kitchen, master bedroom with dressing room/study and four piece en suite bathroom, two further good sized bedrooms and three piece family bathroom. Further benefitting from gas central heating, newly fitted double glazing and ample off road parking. Stunning landscaped gardens encapsulate this property perfectly, beautifully maintained with patio, lawn and mature borders. Gated access to a long driveway providing off road parking for several vehicles. Lawned front garden with tall boundary trees providing privacy. Detached double garage and iron gate to pathway leading to side main entrance door. Private gardens surrounding the property including two paved courtyard areas at the main property entrance and rear entrance. Lawned garden with borders of mature shrubs, bushes and trees.